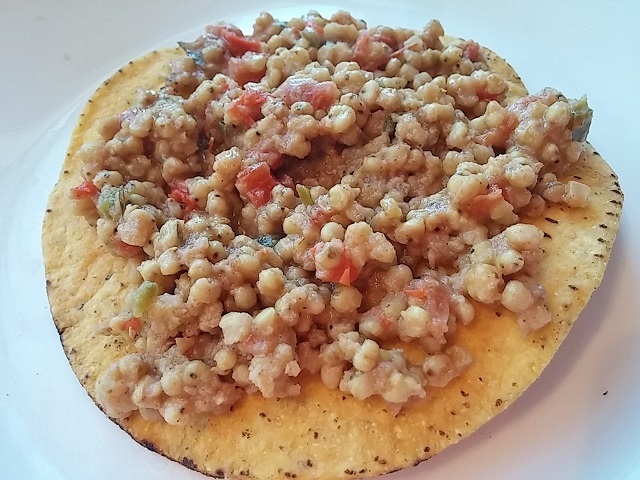 For centuries sorghum has been used as a flour for flatbreads in both India and Africa. Today, its similarities in taste and texture to wheat flour make it a worthy gluten-free baking option. This ancient grain has plenty of health benefits, too. Sorghum has abundant levels of fiber, unsaturated fats and nearly half the daily intake of protein. It is rich in minerals like phosphorus, potassium, calcium, and iron, and such vitamins as niacin, riboflavin, and thiamine. Plus, it has more antioxidants than blueberries and pomegranates. Sorghum’s exterior shell presents more of a cooking challenge than many ancient grains. Since a prolonged low simmer is necessary, the slow cooker is an ideal tool for the job. I recently gave it a try in my small slow cooker and I ended up with a mellow satisfying chili variation, sans meat. Once the sorghum was almost tender, I added a sautéed vegetable melange along with diced tomato, and let the flavors simmer until thick. Spiced up to personal taste, the Sorghum Chili yields a slightly chewy texture similar to barley, making it a nutrient-rich, light alternative to the traditional heavy bean laden chili. Layer it with plenty of optional components like onion, tomatoes, and cheese. Here are two cooking options, a stove-top version and a crock pot alternative. In a medium sized pot, bring 2 cups water to a boil. Add half of the oil, salt, sorghum, and cook 5 minutes; reduce to medium. Cover and simmer until water reaches the level of the grains, 30 – 40 minutes. Meanwhile, in a sauté pan, add remaining oil, the onion and garlic and sauté until soft; add the pepper and seasonings and stir until aromatic. Add the Roma tomato and toss to combine and add all to the sorghum. Reduce to low, placing a double layer of tea towel under the lid to absorb moisture, and cook until the water has evaporated and the grains are puffed with a tender bite, an additional 10-15 minutes; a total of 45-55 minutes. Adjust seasoning. Stir in ½ cup grated cheese until melted and creamy. Serves 3-4. Cooking in a slow cooker may accumulate water in the lid, which contributes excess liquid to the pot. To alleviate the water gain, add a tea towel below the lid in the final cooking stage to help with water absorption. In a small slow cooker set on high, combine 1 cup sorghum and 2 ¾ cup boiling water, drizzle with oil and a sprinkle of salt. Cook on high for 2-3 hours, or until the water reaches the level of the grains. Add the seasoned sautéed vegetables, reduce to low, cover with lid lined with a double layer of tea towel to absorb moisture, and cook until the water has evaporated and the grains are puffed with a tender bite, an additional 30-40 minutes. Adjust seasoning. Stir in ½ cup grated cheese until melted and creamy and serve. Serves 3-4. Previous: Previous post: Jerk Pork: it’s grill time!